increased $7.9 billion or 4.1 percent to $200.4 billion. orders and orders for nondurable goods. backlog was up 0.2 percent. manufacturers' orders occurred in the durable goods sector. turbines and office and computing equipment. increases were in petroleum and tobacco products. downward trend during most of this year. noncapital goods industries were unchanged from October. October 1.41, and September 1.41.
or call Ruth Runyan or Kathleen Menth, (301) 763-2502 or (301) 763-2512. Staff at the Bureau of the Census (301/763-2074) can provide content information and general guidance, or write for a brochure to CENDATA. DUSD, Bureau of the Census, Washington, DC 20233. SIC Nov. Oct. Sept. Aug. Oct. Sept.- Au.- Nov. Oct. Sept. Aug.
Consumer staples................. 38,125 37,419 38,088 37,280 +1.9 -1.8 +2.2 38,1899 1,19 40.99 3".41. Capital goods industries........ 16.599 35,730 34,768 14.928 +2.4 +2.8 -0.5 16h.682 15.5 136,8 31. SIC Nov. Oct. Sept. Ag. ct. pt. Aug.- Nov. Oct. Sept. Aug.
data are comparable to those published annually in the MA-175. Shipments to Federal Government Agencies. Iee footnotes at end of table 2. SIC Nov. Oct. Sept. Aug. Oct.- Sept.- Aug.- Nov. Oct. Sept. ASi. Nov.
, h9 S, 0 + . Nondurable goods industriest ....... 41,.5 41. 4 1,*8 2 241 ..
Tobacco product s.................. 3)I 329 2h 2 -. Paper and allied prod ts .......3.. 9 ,4) ,85 ,92 7. -i. All other nodurahble goodn......... ,R89 ,,,, 7f, ,h ,845 7i. -i. +0.3 50,47 O 50,615 5,5 5 i. Stone, clay, and glass products... 1,693 1,710 1,697 1.751 -1. Transportation equipment......... 11,599 11, 53 11,625 11,281 +0. Instruments and related products.. 2,612 2.627 2,625 2,662 -0. Paper and allied products....... 1,196 1,186 1,157 1,17 +0. Chemicals and allied products ..... 3.412 3,479 3,-83 3,351 -2. Stone, clay, and glass productts... ,12 ,1 )57 ,86 .15 + 2. Instruments and related products.. ii 7.o2 2, pI 2,942 -1. +1.6 -2.8 8,22 8,019 7 ,4, . -0.5 0. 2, 57 2,28i 2, 3 2. +1.5 -1.3 27 0,2 31 2 7 "
+1.2 +1.7 1 ,975 l ., 13,8 4 . -0. 1 +7.9 ,40, h 7,. +3.3 +0.9 3,7 1 4 ,4'ih ,17 7. 0.3 8 ,', 79 4.,73 ,. ,. ,, ,' .0 . Nov. Oct. Sept. Aug. Nov. Oct. Sept. Avg. Preliminary. rRevised. X) Not applicable. (NA) Not available. 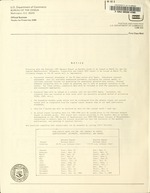 building paper; die-cut paper and hard; chemicals; petroleum tond coal products; and rubber and plastics products, n.e.c. SIC Nov. 1981- Oct. Nov. 1981- Oct. Nov. 1981- Oct. Nov. 1981- Oct.
o Data for 3 months ago will be replaced by data for the current month I year ago. publications, and updating of seasonal factors. Any questions regarding this announcement can be answered by calling (301) 763-2502.